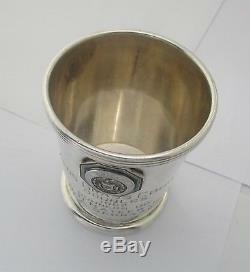 Offered for sale is a beautiful, Sterling Silver pattern "Mint Julep Cup " manufactured by Bailey, Banks & Biddle. 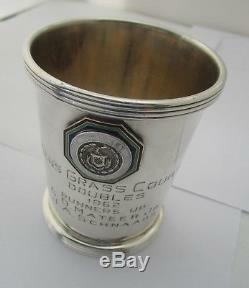 The Mint Julep Cup is 3 1/4" tall by 2 7/8" in diameter with an inscription. 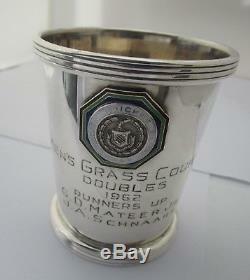 There is a nice enameled badge on the side of the cup with the name "Merion Cricket Club". 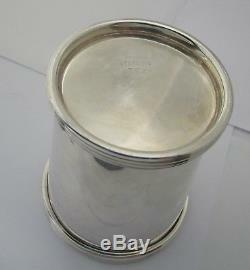 The bottom of the Cup has the hallmark of the maker, pattern number and the word sterling. 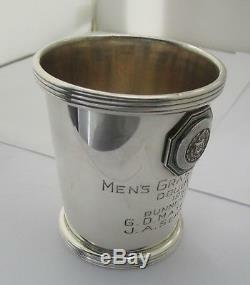 The Mint Julep Cup is in very good used condition with No Repairs. There are two very slight dings on the side of the cup but does not impact the overall cup appearance. The Cup has normal surface wear. Commensurate with the age of the piece and normal usage. (see pictures for close ups). We have a number of early unusual pattern Pie Servers, Serving Spoons, Butter knives, fruit knives and Cheese knives for sale in our store please take a look. They make wonderful and unusual gifts! Thirty day unconditional return privilege. 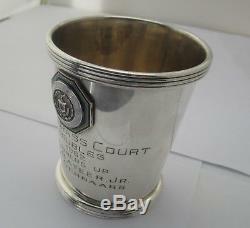 The item "Bailey Banks & Biddle Sterling Silver Mint Julep Cup Cricket Club Trophy" is in sale since Thursday, September 20, 2018. This item is in the category "Antiques\Silver\Sterling Silver (. The seller is "allstan" and is located in Enfield, Connecticut. This item can be shipped to United States, Canada, United Kingdom, Australia, Japan, Ireland, New Zealand.